”Many researchers have put a lot of work into exposing the way that many if not most of the ‘terror’ events the world has been forced to endure are, in fact, organised by factions within the very governments who are tasked with protecting the victims. This type of ‘false flag’ attack is generally used to drum up support for policy changes that generally generate profits for arms corporations, extend the limits of state/government control and reduce the liberty of the populations involved. Unsurprisingly, here’s evidence of a move to do exactly that from Theresa May in Britain as a result of the recent Manchester event and also to extend the ‘state of emergency’ in France that give the government extended powers. Further evidence for this pattern is already well documented and can be found in ureka and elsewhere. I will embed some videos that cover this in more detail further down this page – for now though i want to focus on a specific topic… numbers. The chance of 1 terror event falling on any one specific day of a month is roughly 1 in 30, since there are an average of 30 days in a month. The chance of 1 terror event falling on a specific month of the year is 1 in 12 or (1 / 12). The chance of 1 terror event falling on a specific day of a specific month is, for the purpose of this calculation – roughly – 1 in 360 (based on the average of 30 days in a month). What is the chance of 2 terror attacks sharing the same month? That would be calculated by multiplying the probability of each event by each other, so: (1 / 12 * 1 / 12) = (1 / 144). What is the chance of 2 terror attacks sharing the same day of the month? What is the chance of 2 terror attacks sharing the same day and month? What is the chance of 6 terror attacks sharing the same day of the month? 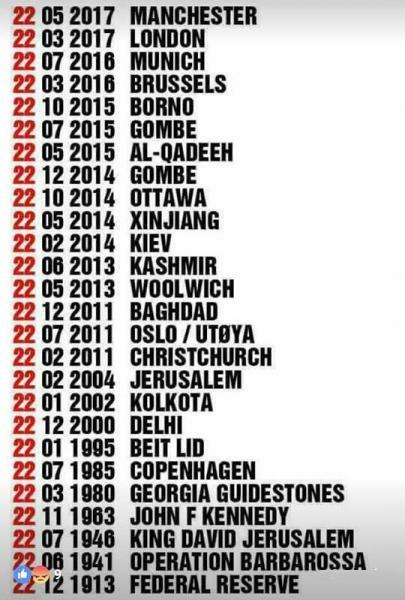 What is the chance of 1 terror attack occurring on a specific day in the month and in one of only 3 months out of 12? 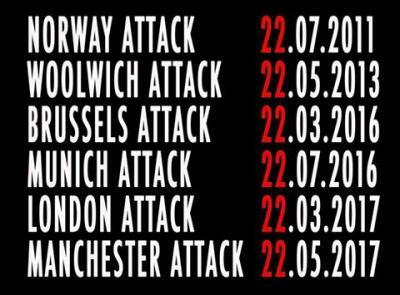 What is the chance of 6 terror attacks sharing the same day of the month and also the same 3 months out of the 12 possible? So the overall chances of 6 ‘random’ events falling on the same day of the month within the same 3 months of the year is around 3 TRILLION to 1! CLEARLY there is more than just ‘random chance’ going on here and since these calculations don’t even take into consideration the similarity of the events involved, the actual probability of these events occurring by ‘chance’ in this way may be much lower than 3 trillion to 1. So.. What could be the cause of the date patterns? The problem with this idea is that the islamic calendar has a totally different number of DAYS in it to the western ‘gregorian’ calendar – which means that it is probably almost impossible for such a repeating pattern that is meaningful in the gregorian system to also have meaning in the islamic system. Can we find anyone else who is linked in to these number patterns in some way? Well, since the other prime candidate for being the true planners of these terror events is often thought to be members of the shadow governments of the western nations and the western secret societies – such as Yale’s exclusive and small ‘Skull & Bones’ society (which both George Bush Jr. and Sr. AND John Kerry were all members of).. Well, maybe we should look at their calendar and the way that they deal with numbers… Makes sense to me. Anyway, back to the numbers.. As it turns out, they appear to have a well defined numerical code, a system of numerology, that they apply to many aspects of their lives – even including the way they lay out photos of their group and the hints they drop through symbology and even architecture. In fact, the topic is so vast that it takes weeks just to even start to look into the full scale of the many examples of the number codes that appear to have been inserted into our world by this and related groups. We can see that this group definitely likes to encode numbers and symbols into their activities, but are they connected to 22, 3, 5 and 7 in some way? Well, we know their main number symbol is 322 – which is obviously 3 and 22 – so, yes, on the surface there is a symbolic connection. To really do some useful analysis though, we need to go beyond hypothesis and just stick to known facts. Let’s see what we can learn from what is known about numerology. 22 is the number of letters in the hebrew alphabet (and several other older alphabets) and also the the number of paths in the Jewish mystical Kaballah’s Sephirot. There are 22 tarot cards – the card system used by ‘mystics’ to call for psychic guidance. There are 22 writable regular polygons in an Euclidiean circle: 3, 4, 5, 6, 8, 9, 10, 12, 15, 18, 20, 24, 30, 36, 40, 45, 60, 72, 90, 120, 180, 360. These are twenty-two of the twenty-four dividers of 360, the two first, 1 and 2, not defining polygons. The head of the man is constituted of 22 bones: 8 for the cranium and 14 for the face. The 22 is the most powerful of all numbers, able to turn lofty dreams into realities. It is confident, pragmatic, ambitious and disciplined. Remember: It doesn’t matter if YOU believe in the validity of numerology, it only matters that SOME people believe in it enough to use it when carrying out their evil deeds. So, it sure looks like someone might be attempting to manifest something using these terror events in a way that is to them using some kind of numerical method of ‘magically’ or ‘metaphysically’ empowering their actions. Are these also evidence of a numerologist connection? I leave it to you to decide! All violence is a problem. Let’s not forget to follow the money and look at all involved. My birth date is 3/22. This is a really thorough report. I will direct others to it. I’m seeing many people wake up to the pattern with this latest sacrifice ritual in Manchester. Unfortunate that hearts are so closed that it requires this massive injustice to open them, but perhaps the field will soon be so densely packed with Truth seekers and sharers that the next ritual can be prevented before it begins. the polarisation will continue to spark those who are heartless to push for more heartlessness and those that are balancing to consider ways to stop the polarisation. i feel that the extremely reversed nature of many of those causing the violence means that even if god came to them in a form that they could accept as god and told them to change their ways, many of them would not survive the shock. This thread is meant for investigation into the more occultic Aspect of The Talmudic Zionist Zohar Black Magic Kabbalah Rituals and Symbolism! 911zig – there are fairly clear connections from the cults involved to numerology, yes. if this were an effective murder investigation that left no stone unturned, the fact that these cults use these numbers would probably feature prominently in the investigation. 911zig – one way of finding out if that event is relevant would be to trace every body and find out if they were really ‘real’ people or if the number was just manufactured for symbolic purposes. i have no idea how to go about doing that though!